Unless I'm actually at the theater, I've never been one to sit down and watch a movie all the way through. I just don't have the attention span! So, I tend to watch movies I've already seen 100 times. That way I can do laundry, cook, work on the blog, etc... and I don't really have to pay attention. Since most of my favorite movies are pretty old, I can usually find them on VHS at thrift stores. They're never more than a dollar each. You can't beat that! After taking a look at my little VHS collection, I came to realize just how weird my taste is. I mean, how random are those movies? I'm sure you've heard of them all... except for maybe that Dance Workout Barbie video! I've had that since I was about 6. I think I've kept it for this long because it's hilarious. I totally used to work out to it as a kid too. Oh, and here's a fun fact... Jennifer Love Hewitt is in it! So, what's my point? Well... if you've read any of my previous Let's Get Real posts, you'd know that I don't actually have one. I just like to give a little insight into my life once in a while. I also love to read the feedback! So what about you guys? Am I the only one with a bizarre VHS collection like this? 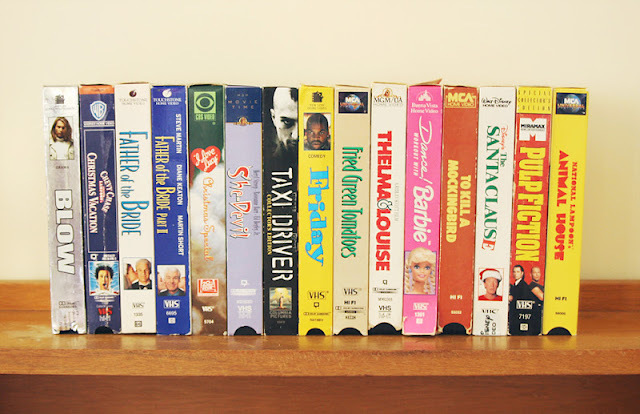 We still have some VHS tapes. We have a bunch of DVDs, but we don't watch movies that often at home. We watch netflix too much. Unless it's holiday season. Then, we have a huge box of Christmas specials that we have in rotation to play while decorating and baking and such. Same here! I watch Netflix a lot too but when the holidays come around we bust out the box of Christmas movies! Holy cow, I thought I was the only one who was not into watching movies outside of a theater! I do the -exact- same thing, I like watching movies I`ve seen 100 times so you don`t really have to pay attention. I feel so much better now! Thanks for sharing! Thank YOU Chelsea. I thought I was the only one too! No, you are totally not the only one! I do too- I love my VHS collection! My boyfriend gives me a hard time about them all of the time. He is big on Blue-Rays, and thinks my VHS are ancient and just plain "silly to have". But I'm also like you, I usually put in a movie while I'm photo editing, or doing house chores. I like to re-visit my favorite movies, but I like that I'm not wasting time while doing that. Yes! Exactly, Kayla! I do it with tv shows on Netflix a lot too. In fact, I'm making a wreath as we speak and watching episodes of The Office that I've seen a million times already. You really can't! I'm too cheap for DVDs! Haha.